Throughout the years, the band also appeared on a few movie soundtracks and lots of compilations, among which some of the famous Dwell Records-tribute recordings (tributes to, for example, King Diamond, AC/DC and Led Zeppelin), as well as the fifth edition of the Hells Headbangers Records-sampler series. 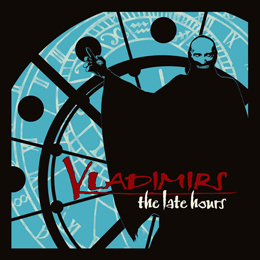 The Late Hours was originally released at the end of 2011 through Hells Headbangers Records; the review, written back then by undersigned, is still readable in Concreteweb’s archives-section, but for you and me being extremely lazy, I’ll just copy most of it with a limited amount on adaptations, complements or nuances. You don’t need to ‘search for’, I don’t need to re-write; I’ll just listen to the stuff once again (or twice, three times, …?) and change / add / delete excerpts when I feel to. The intro above, for example, is almost integrally taken from that review. Anyway, the album brings fifty four minutes of so-called Horror-Punk, which can be defined as some mixture of Goth Rock, Rockabilly, Punk Rock, Death Rock, Groove, Doom and Heavy Metal. Read: Misfits - meets - Samhain - meets - Ramones - meets - Christian Death - meets - Carnivore - meets - Discharge - meets - American Werewolves - meets - Devils Whorehouse - meettsss and so-o-o-o-on. A shame: the lack of variation (most songs do sound like another time after time), the lack of originality, and the lack of progression in comparison to the past. A must: for being some tribute band to some of the protagonists of the Horror-Rock genre i.e. Misfist, the Glenn Danzig-era particularly.